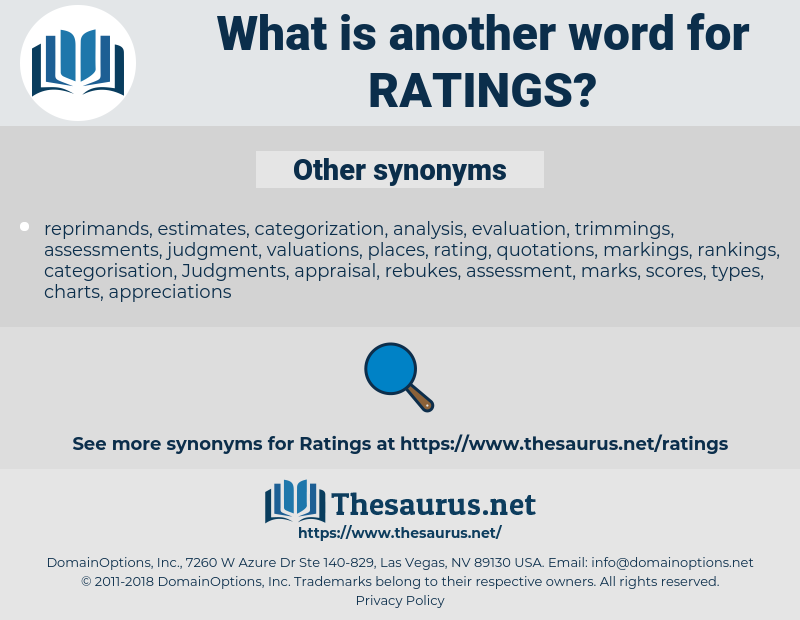 What is another word for ratings? annotations, evaluators, minute, TNA, EIAS, numbers, validity, highs, values, endnotes, briefs, transcript, valued, valeur, facts, valuable, worth, assess, Rated, qualification, Assessing, categorizing. descriptions, characterizations, ratios, cataloging, percentages, categorizations, listings, credentials, Correcting, ranks, considerations, briefings, certificates, indicators, reclassifications, headings, sittings, benchmarks, hearing, Hearings, approximations, representations, averages, investigations, examinations, determinations, proportions, overnights, viewers, GIANTS, Achievements, requirements, denominations, reputations, deliberations, estimations, Fishermen, charts, qualifications, indications, Commentaries, quality, Qualities, apprentices, tiers, reconsiders, Descriptors, ceilings, TNAS, distortions, insights, registers, merits, ranges, constraints, appraisers, numerals, Perceptions, audits, consumption, calculations, Indexes, Indices, tariffs, critics, Hierarchies, judgements, thresholds, estimates, restrictions, findings, Analyses, Opportunities, corrections, memorandum, Memorandums, 'audiences, projections, receipts, times, crewmembers, quotations, adjectives, viewpoints, digits, Judgments, clearances, ordinary, criticisms, competencies, listens, observes, pointers, reflections, qualifiers, bulletins, Diplomas, IAS, subscripts, ADRS, subscores, assumptions, giveaways, Virtues, audiences, associates, references, letters, Pers, points, Scales, opinions, dimensions, level, Distances, exposures, allowances, Possibilities, circulars, signs, ideals, hints, mariners, Entries, PROSPECTS, retreats, quotas, notices, Agencies, comments, bars, outcomes, Castes, consumed, chances, seafarers, responses, brackets, answers, tones, reports, data, potencies, corrected, oas, Sailors, Journals, deckhands, screens, SATS, Exercises, scans, skills, transcripts, Tests, EXAMS, returns, Boundaries, notebooks, Classes, Taxes, items, weakens, remarks, markers, Prices, Duties, yields, listen, workups, powers, papers, layers, views, leads, limits, outputs, Records, tables, declines, buyers, Charges, tips, bounds, avenues, VOTES, EAS, dips, Keys, quotes, logs, sheets, chits, figures, bills, Schedules, Las, ribs, teams, memos, Replies, results, drops, dots, Beliefs, bands, look, Fees, Studies, clues, claims, assesses, Levies, seas, men, model, Cues, sides, evaluators, numbers, highs, values, endnotes, briefs, valued, facts, assess, Rated, notations. 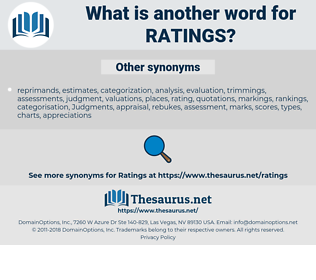 ranking, rankings, classification, Classifications, rate, notation, notations. rethink, radiating, rewording, reading, redneck, rotting, riding, redeeming, rittenhouse, red-ink, radiance, readiness, reedmace, red ink, ruddiness, rottenness, rhythmic, redness, riddance, reed mace, rioting, readying, radioimmunoassay, rowdiness, redwing, raiding, rooting, ratting, rewarding, radio news, rewriting, rhodymeniaceae, rudeness, radio noise, redding, Road To Damascus, ready-mix, radiancy, rationing.